Virginia community college to offer the training program. Mountain Empire Community College’s first class of potential power linemen will begin its training on July 17. It will if Tommy Clements, the college’s dean of applied science and technology, can hire an instructor, design a curriculum, acquire equipment, set up a pole yard and coordinate the needs of a handful of public and private partners before then. Clements also needs to find a 20 percent match so he can access the $950,000 grant the Appalachian Regional Commission awarded the Wise County community college in January. If all that comes together — and Clements expects it will — Mountain Empire will become Virginia’s second community college to offer this training. Southside Virginia Community College runs the other program. Clements anticipates three groups will work their way through a 15-week course each year. Tuition will be about $10,000. For that, students will get four eight-to-10-hour training days a week, plus a shorter day of job shadowing where they will watch lineman in action. “The power company suggested that some people might not really want this job if they know what it’s about,” Clements says. Throughout the course, students will learn skills directly related to being a lineman, but the emphasis in the first weeks will be on how to work safely. The course also will include commercial driver’s license training and preparation for the Construction and Skilled Trades exam. “What we’re doing is … restacking credentials,” Clements says. That way, students who don’t complete the course still will acquire useful skills, a plus in a county with an unemployment rate twice that of the commonwealth. 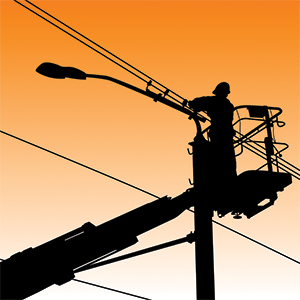 Program graduates could earn more than $100,000 a year as linemen — but not right away. “When you do this lineman school, that doesn’t make you a lineman,” Clements says. “That makes you eligible for the apprenticeship,” which can last five years. That’s one reason Dominion Virginia Power and American Electric Power, the parent company of Appalachian Power, support the program.